In recent months, much debate has occurred surrounding the prospect of a new national car project, with a proposal for a locally-­manufactured electric car company currently being developed by GreenTech Malaysia, an entity under the purview of the Ministry of Energy, Technology, Science, Climate Change, and Environment. Electric vehicles (EVs) have tremendous potential in curtailing greenhouse gas emissions within the context of the transportation sector, but only under the appropriate conditions. 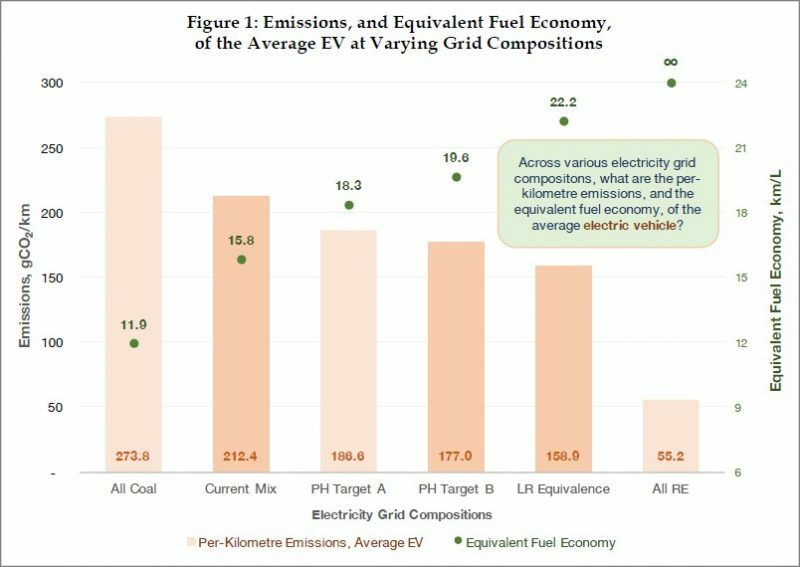 An often overlooked feature of EVs is that they shift the source of vehicular emissions from tailpipe to smokestack, and if electricity is predominantly generated from carbon‑intensive sources such as coal, the environmental effects of vehicle fleet electrification may indeed be negative. With this in mind, the Penang Institute in Kuala Lumpur (PI in KL) has produced a paper in which he analyses the life-­cycle emissions of EVs against those of internal-­combustion engine vehicles (ICEVs) and hybrid vehicles (HEVs) across several electricity grid compositions of varying carbon intensities. The results of this analysis confirm the fears that EVs are at present more polluting than petrol-­powered cars, and a significant reason for this is the enormous share of coal in electricity generation in Malaysia. An overview of these results is presented in Figure 1. Under the current electricity mix, the average EV, which requires 17.6kWh per 100km, is as polluting as an ICEV or HEV which attains a fuel economy of just 15.8km/L. This figure rises to just 19.6km/L if Pakatan Harapan’s RE targets are met in 2025, and 22.2km/L if the contributions of coal, natural gas, and RE (including large-­hydro) are roughly equal. To put these figures into context, the Perodua Bezza attains a fuel economy of 21km/L, and the United States’ Environmental Protection Agency cites the Hyundai Ioniq as having a fuel economy of 25.7km/L. This suggests that even if PH’s RE targets are exceeded, EVs would likely still be more polluting on average than fuel-­efficient ICEVs, and most HEVs. Per-­kilometre emissions of various EV models are highlighted in Figure 2, and contrasted against those of the Perodua Bezza. This comparison serves to strengthen the notion that EVs would be disastrous, from an environmental perspective, should they be introduced in Malaysia today. Any petrol-­powered vehicle which attains a fuel economy greater than 15.8km/L is cleaner than the average EV, aside from the Bezza and Ioniq, many existing ICEVs and HEVs are capable of routinely exceeding this figure. These include the Toyotas Camry Hybrid and Prius, the Proton Saga, and the Perodua Myvi, amongst others. As shown in Figure 3, even Tesla’s Model 3, one of the most energy-­efficient EVs on sale in numerous international markets, attains a fuel economy equivalent of just 18.3km/L under the current electricity mix, which makes it more polluting than the Bezza, Prius, and Camry Hybrid, and just as polluting as the Saga. 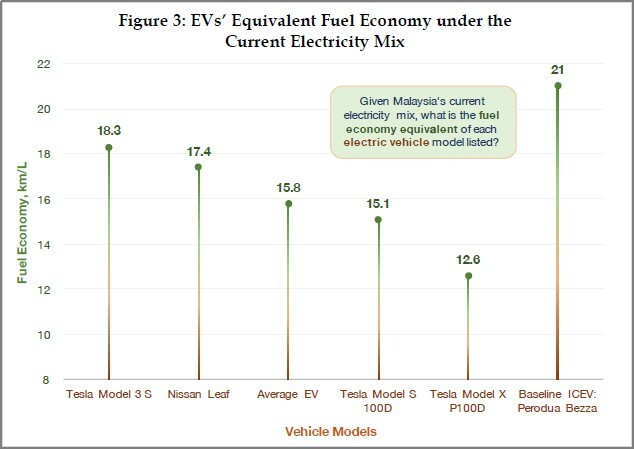 Combined, this evidence suggests that a shift to EVs in Malaysia today would be detrimental to climate change efforts. A more environmentally-­friendly policy would instead incentivise fuel‑efficient ICEVs, as well as HEVs, which are for the most part considerably less polluting than EVs. Figure 3 shows that ICEVs and HEVs which obtain a fuel economy of 18.3km/L or more are cleaner than almost all currently‑available EVs; incentivising and encouraging the use of petrol-­powered cars that meet these requirements would be a positive step towards reducing emissions from private road transport in Malaysia. Table 2 presents in percentage terms the relative emissions of the various EV models, against those of the Perodua Bezza. It confirms the results visually depicted in Figures 2 and 3. 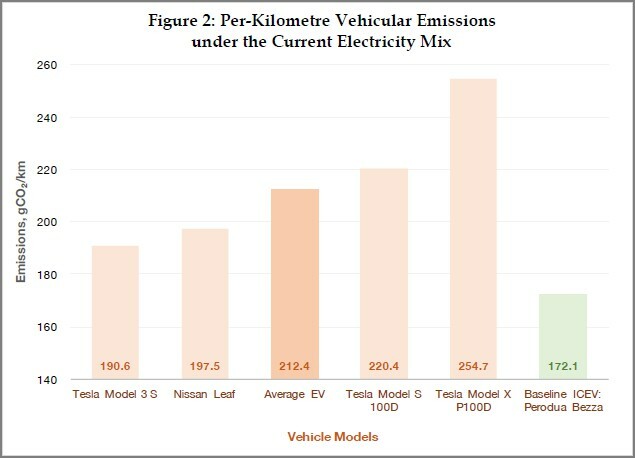 Under the current electricity mix, emissions from the Tesla Model 3 are 10% higher than those of the Bezza; emissions from the average EV are 23.4% higher than the Bezza; and emissions from inefficient, high‑performance EVs such as Tesla’s Model X are up to 48% higher than the Bezza. What is more concerning is the fact that even if Pakatan Harapan’s renewable energy (RE) targets are met, EVs are still largely more polluting than fuel‑efficient ICEVs, and most HEVs. At this stage, only very efficient, compact EVs are cleaner than the Bezza, but even then, the magnitude of the emissions reduction lies between 1.5 and 4.7% – too small a difference to justify a large, present-­day investment in EV technology. It is only when Malaysia’s electricity grid approaches a state where the contributions of coal and RE are roughly equal, at 35%, that steady emissions reductions can be expected from vehicle fleet electrification. It is also important to remain mindful of the fact that fuel economy ratings of ICEVs and HEVs is, and has been for years, on an upward trend. This is partly due to technological development, but also to the implementation of fuel economy standards in numerous markets: the US and the EU, as well as China, Japan, and South Korea, amongst others, regulate vehicular emissions and mandate annual increases in fuel economy ratings across new vehicles. As a result, it is likely that EVs will continue to be more polluting than ICEVs and HEVs in Malaysia beyond 2030, especially considering the fact that the country is only projected to reach 20% RE by 2025. The importance of a significant, persistent long‑run decarbonisation of the national electricity grid cannot be stressed enough. Given these projections, what can be done instead to reduce emissions associated with private road transport in Malaysia in the shorter-­run, while we prepare the electricity grid for a long-­term transition to EVs? A first step would be to revamp the existing energy efficient vehicle (EEV) policy, introduced by the Ministry of Trade and Industry (MITI) as part of the 2014 National Automotive Policy (NAP). The EEV program is at present too broad in its scope, too lenient in its requirements, and too opaque in its incentivisation structure; an overhaul is necessary to ensure its effectiveness from an environmental perspective. For instance, a 2,500kg car which attains a fuel economy of 8.5km/L is clean enough to be considered an EEV in Malaysia, but the same car cannot even be sold in China, Japan, or South Korea because it is too polluting. This disparity should be addressed by MITI in the form of more stringent standards, and it is encouraging that the Ministry has recently announced that it is reviewing the 2014 NAP. Another option would the implementation of national fuel economy standards. With over half‑a­‐‑million new vehicles sold in Malaysia annually since 2010, fuel economy standards, which mandate annual improvements in the energy efficiency of ICEVs and HEVs, are capable of mitigating the per‑kilometre emissions associated with new private vehicles in Malaysia. Automakers have shown that they are capable of meeting stringent fuel economy requirements in numerous international markets – they should do so in Malaysia too. The third measure is without doubt the most important: improvements to the accessibility, reach and use of public transportation across the country. Public transport options, such as buses and trains, are far less polluting per passenger‑kilometre than all private transport options, and a well‑functioning public transportation network can reduce the need for, and use of, private alternatives. In the short and medium‑run, these policies are capable of significantly outperforming vehicle fleet electrification in the context of climate action, and at much lower financial and environmental costs. The time will come for EVs to propel another, future wave of emissions reductions from the transport sector in Malaysia, but the country – and its electricity grid – simply isn’t ready yet. * Note: This media statement, and the accompanying research paper, was written by Darshan Joshi, Research Analyst at the Penang Institute in Kuala Lumpur. He can be reached at darshanjoshi@penanginstitute.org. Electricity generation compositions of interest include: i) the current mix, composed of 57% coal, 35% natural gas, and 8% RE (inclusive of large-hydro); ii) ‘PH Target B’, composed of 41% coal, 35% natural gas, and 24% RE (inclusive of large-hydro); and iii) ‘LR Equivalence’, referring to a feasible long-run state where the share of coal is at 35%, natural gas at 30%, and RE at 35% (inclusive of large-hydro).